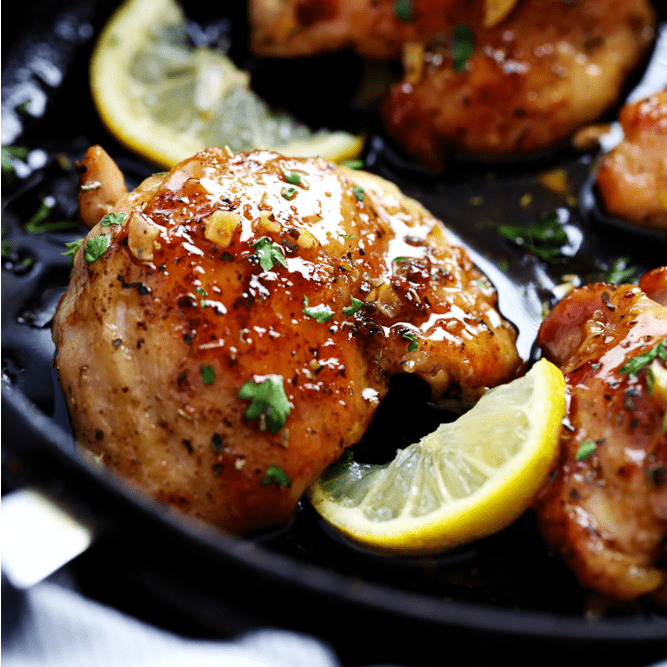 Glazed Lemon Honey Garlic Chicken is tender and juicy chicken cooked in the skillet topped the most amazing lemon honey garlic glaze! You are going to love this simple but full of flavor 30 minute meal! If you haven’t noticed yet, 30 minute meals are becoming my BFF lately. And my skillet meals are becoming quite popular on my site. 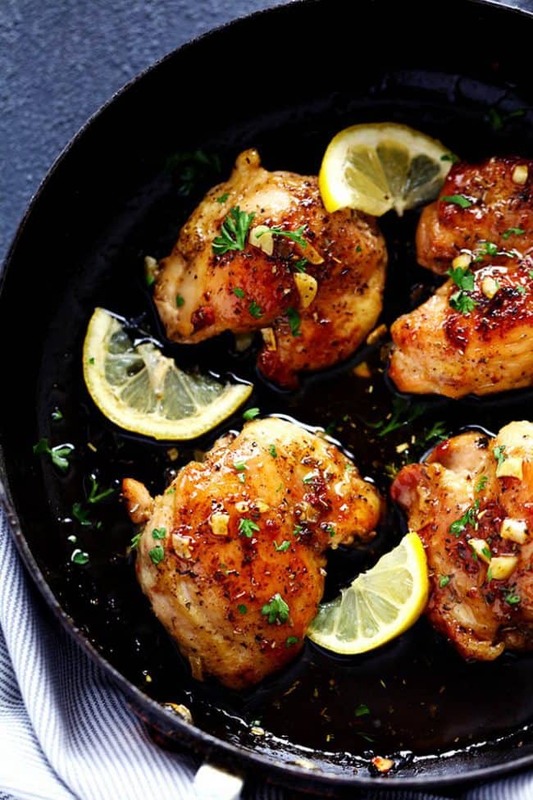 This Creamy Tuscan Garlic Chicken is soaring to one of the most popular skillet meals on the site! These 30 minute meals are saving me during the busy school year and I am still able to provide a delicious meal that brings the family together for just a few minutes each night. The best part about this recipe is that it only requires a few ingredients. I had all of the ingredients in the pantry and some costco chicken in the fridge and this meal was on the dinner table in no time at all! 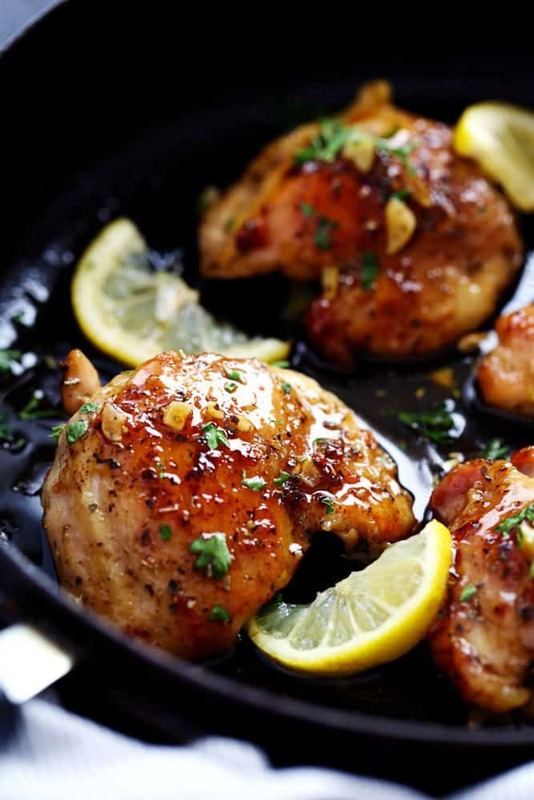 The chicken gets cooked in butter on the skillet infusing delicious flavor and making the chicken tender and juicy. And then the glaze that goes on top is incredible. A little bit of tang from the lemon, plus the sweet honey, and garlic all come together to add big flavor to this simple meal. Your entire family will love this meal! 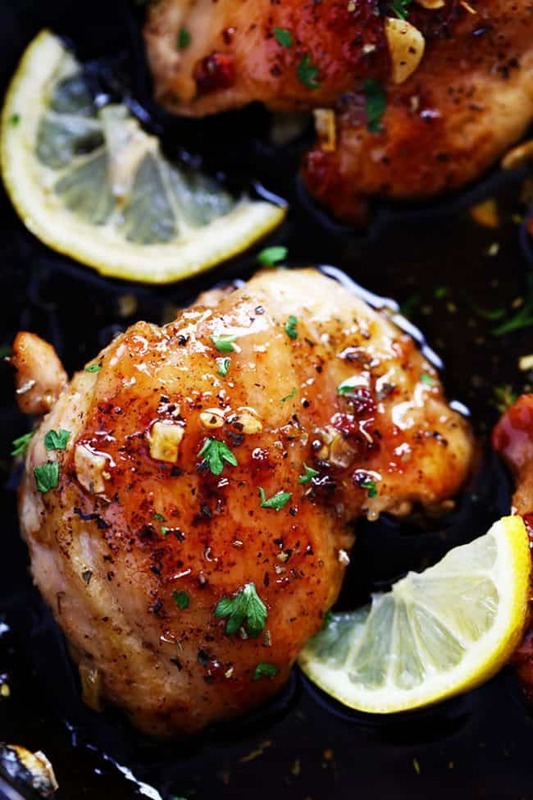 And you will love it because it is easy to make and has the most incredible lemon garlic honey glaze. Simple, minimal ingredients, and big on flavor. That is how we like ’em! In a medium sized skillet add the butter and allow to melt over medium high heat. Add the chicken thighs to the skillet and salt and pepper. Cook for 3-4 minutes on each side or until chicken is no longer pink and 165 degrees. In a small bowl whisk olive oil, lemon juice, minced garlic, honey, soy sauce and italian seasoning. Pour it on top of the chicken and cook for a few minutes to allow the garlic to cook and for the sauce to reduce and thicken. Too much lemon juice. Would be good with half the amount and/or a bit more honey. The lemon at that amount overtook any other flavor. I totally agree! Wish I had read this before making it. The amount of lemon really made it taste more like sweet and sour sauce to me. Hey girl yummy for my tummy! This looks amazing! 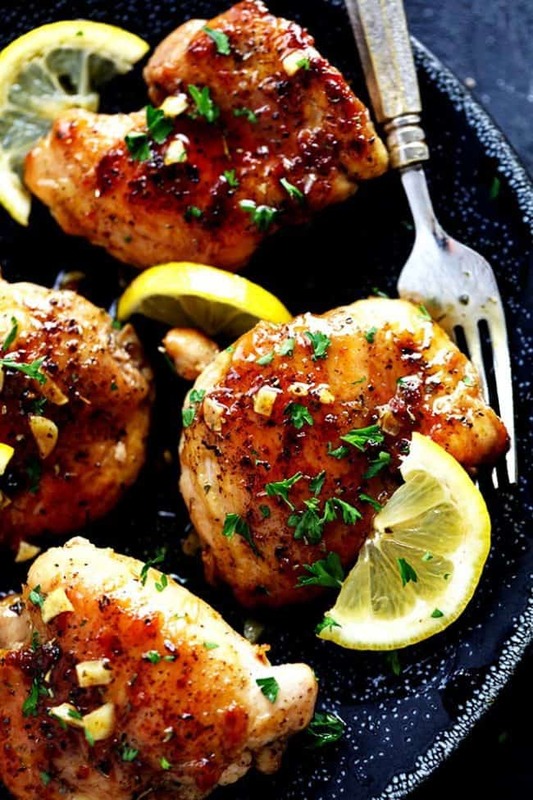 I think I have the perfect Honey Lemon recipe for chicken (courtesy of myfiveboys.com) but I am going to give yours a try. What would be 1 or 2 good side dishes for this? Honey and garlic ? how come? Does it go in the oven or do u just fry it in the skillet on medium high? I thought the lemon might be too powerful, but it was a great mix with all the other flavors! Delicious recipe loved by the entire family. Way too much lemon. Other than that, the recipe is good, will try again with less lemon juice and a kick of something spicy to add some heat. Yum. This recipe was really delicious! I loved the lemony flavor with the hint of honey. I don’t really care for sweet meat, but the honey amount was just enough. It was very easy and quick to make. My husband really loved it… said it was different, in a good way. I made this and used juice from 1 lemon only and added 1 TBS of Cream Sherry and it is EXCELLENT. This was an incredible dinner! I loved the addition of the lemon with the honey garlic. Tons of flavour and super juicy. This recipe was amazing! My entire family loved it and I was able to pat myself on the back for stepping out my comfort zone with different flavor combinations. The only thing I would say is that I had to add a bit of cornstarch because the sauce didn’t thicken the way I wanted. Other than that it was wonderful! Perfect! I like using more lemon juice… Love the ease and beautiful presentation it allows. Thank you! The hubs just had heart surgery, so didn’t use Italian seasoning, and used skinless breasts instead of thighs. But yum, yum, yum. I’ve made this several times…it has become a family favorite. In fact, I now make a pound or so more than needed (and up the other ingredients, as well)…let the chicken cool, then shred and add a whole fresh avocado (mashed). Keeps in the fridge until we’re ready to have the best chicken salad I’ve ever eaten. And the heart-healthiest. Thank you for the great, and easy, recipe! PS Is that fresh parsley in the photos? Beautiful presentation with the lemon slices, too. Oh no! I am so sorry about your husband. I hope things get better for him. I love your substitutions and still seems like it tasted good. Thanks for sharing! Yes, that is fresh parsley on top in the photos.